This article is about the North Korean city. For the Australian politician, see Hector Rason. For his ministry, see Rason Ministry. 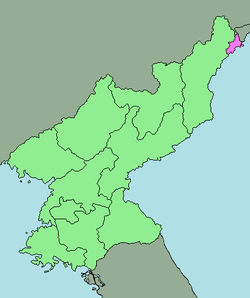 Rason (formerly Rajin-Sŏnbong; Korean pronunciation: [ɾa.sʌn, ɾa.dʑin.sʌn.boŋ]) is a North Korean city and ice-free port in the Sea of Japan in the North Pacific Ocean on the northeast tip of North Korea. It is in the Kwanbuk region and location of the Rason Special Economic Zone. In South Korean pronunciation, the initial "R" of the name is pronounced as "N", (나선, Naseon) as per standard Korean phonology. In 2000, the name was shortened from "Rajin-Sŏnbong" to "Rason". During the 1930s, the Japanese called it Rashin; at that time, it was an important port at the end of a railroad line. It was liberated by the Red Army on 14 August 1945. Before 1991, Rason was used by the Soviet Union as an alternative warm-water port in case Vladivostok was unavailable. 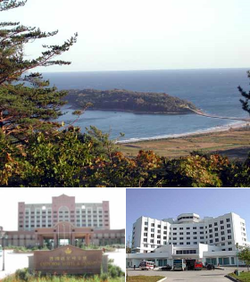 From 1993 to 2004, it was administered separately from North Hamgyŏng as the directly governed city (Chikhalsi) of Rason. Prior to 1993 and from 2004 to 2009, the city had been part of the North Hamgyŏng Province. Since 2010, the city is a "special city", again breaking from provincial control, but different from its older designation as a directly governed city. What this means in practice is unclear. Rason borders Hunchun county in Jilin province of China and Khasansky District in Primorsky Krai of Russia. China is making investments in the port as it gives it access to the Sea of Japan. In July 2011, the Democratic People's Republic of Korea (DPRK) gave a green light for China's domestic trade cargo to be shipped via its port of Rajin from northeast to east China. Coal is shipped from nearby Chinese mines to Shanghai. A casino by the sea caters to Chinese visitors. Rason has a humid continental climate (Köppen climate classification: Dwb). Rason is divided into one district (kuyŏk) and one county (kun). The Korean People's Navy maintains a naval training base at the Rajin Port in the city of Rason. In addition, a Chinese company has leased a dock for 10 years at the port. Rason is home to No 28 Shipyard Najin, a shipbuilder and supplier to the Korean People's Navy. Rajin Station is on the Pyongra Line. ^ a b c d Andray Abrahamian (September 2011). "Report on Rason Special Economic Zone" (PDF). Choson Exchange. Archived from the original (PDF) on 17 April 2012. Retrieved 9 December 2012. ^ Robinson, Thomas W (January 1982). "The Soviet Union and Asia in 1981". Asian Survey. A Survey of Asia in 1981: Part I. 22 (1): 13–32. doi:10.1525/as.1982.22.1.01p0334u. ^ "Rasun Becomes Special City". Daily NK. 5 January 2010. Archived from the original on 22 March 2012. ^ "Strategic Implications of China's Access to the Rajin Port". The Jamestown Foundation. 18 March 2010. Archived from the original on 28 February 2011. ^ "DPRK allows China domestic trade cargo to ship via its port". China Daily. 4 July 2011. Archived from the original on 19 August 2011. ^ Wong, Edward (12 October 2011). "Tending a Small Patch of Capitalism in North Korea". The New York Times. Archived from the original on 13 October 2011. Retrieved 13 October 2011. ^ "Climate: Rason". Climate-Data.org. Archived from the original on 16 January 2018. Retrieved 15 January 2018. ^ "라선시 - 북한지명사전". North Korea Net. JoongAng Ilbo. Archived from the original on 29 August 2013. Retrieved 26 February 2013. ^ "China leases Rason port for 10 years". North Korean Economy Watch. Archived from the original on 9 September 2017. Retrieved 11 September 2017. Wikimedia Commons has media related to Rason. Wikivoyage has a travel guide for Rason. North Korea Uncovered (North Korea Google Earth) Maps out Rason's economic infrastructure, including railways, hotels, tourist destinations, cultural facilities, ports, electricity grid, and electrified perimeter fence on Google Earth.